The NRA basic pistol course covers most types of revolvers and semiautomatic pistols. This course is a minimum of 8 hours and takes place in the class room and at the range giving students plenty of hands on experience. Students can expect to learn how to safely handle, shoot, transport, clean and care for a pistol. Some other topics covered are ammunition, proper terminology, and operations of the pistol. Students will learn to shoot from the bench rest, and two handed standing positions. 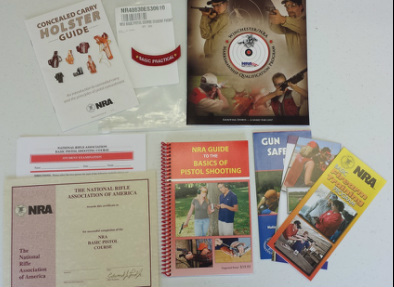 Each student will receive a packet containing the NRA Guide to the Basics of Pistol Shooting Handbook, NRA Gun Safety Rules Brochure, Winchester/NRA Marksmanship Qualification Booklet, take a Basics of Pistol Shooting Student Examination, and Course Completion Certificate. This course is a great starting point for anyone looking to safely shoot and own a pistol! * This course dose not cover muzzleloading pistols.